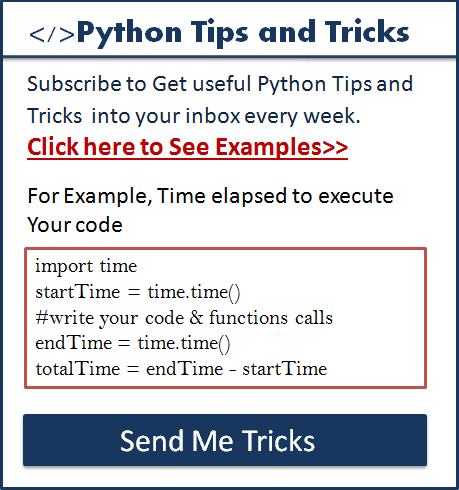 In this article, I will let you know how to generate a random string of length n in Python. for example, You want to generate a random string of fixed length 5. Generate a random string of a fixed length. Generate a random string with lower case and upper case. Generate a random alphanumeric string with letter and numbers. Generate random string password which contains the letters, digits, and special characters. Use the UUID and secrets module to generate a secure random string for a sensitive application. 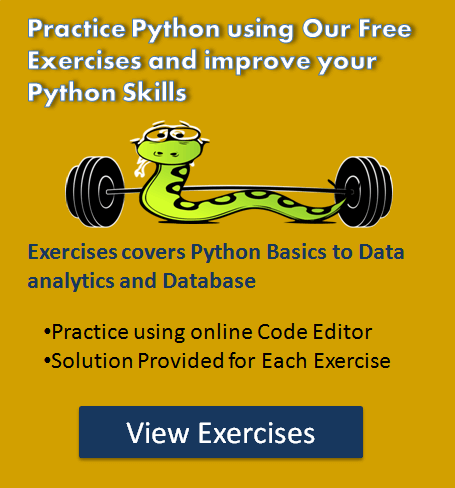 To generate a random string we need to use the following two Python modules. String module which contains various string constant which contains the ASCII characters of all cases. String module contains separate constants for lowercase, uppercase letters, digits, and special characters. random module to perform the random generations. Let see the steps to generate a random string of a fixed length of n.
Run for loop n number of times to pick a single character from a string constant using a random.choice() method and add it to the string variable using a join method. The choice method used to choose a single character from a list. For example, Suppose you want a random string of length 6 then we can execute a random.choice() method 6 times to pick a single letter from the string.ascii_lowercase and add it to the string variable. Let see the code now. """Generate a random string of fixed length """
Note: The above output contains all the lower case letters. If you want only the uppercase letters, then use the string.ascii_uppercase instead of a string.ascii_lowercase. If you want to generate a random string with the combination of lowercase and uppercase letters, then use the string.ascii_letters constant. This constant contains all the lowercase and uppercase letters. Run for loop n number of times to pick a single character from a string constant using a choice method and add it to the string variable. The choice method used to choose a single character from a list. Let see the code now. """Generate a random string with the combination of lowercase and uppercase letters """
Note: The choice method can repeat characters. If you don’t want repeated characters, then use the Sample method. I have demonstrated this in the second approach. s I mentioned earlier, the choice method might pick the same character again. When you don’t want repeated characters in a random string use random.sample() method. Let see the demo. Note: As you can see in the output all characters are unique. random.sample() never repeats characters, and this is considerably less secure than using random.choice(). Many times we need a random string which contains both letters and digit. For example, you want to generate a random string like ab23cd, jkml98, 87thki. We need to use the string.ascii_letters and string.digits constants two get the combinations of letters and digits in our random string. Now, Let see how to generate a random string with letters and digits. """Generate a random string of letters and digits """
The password which contains characters, digits and special symbols are considered to be a strong password. For example, you want to generate a random Password like this. Use three string constants, I.e., string.ascii_letters , string.digits and string.punctuation along with random.choice method. Use string.printable and random.choice method. Here string.printable contains all lower case and upper case letters, digits, and special characters. Let see the example now. In this example, we are using string.ascii_letters , string.digits and string.punctuation along with random.choice method. """Generate a random string of letters, digits and special characters """
Generate a ten-character alphanumeric password with at least one lowercase character, at least one uppercase character, at least one digits and at least one special character. """Generate a random password """
Above all examples are not cryptographically secure. To cryptographically secure random output use the random.SystemRandom().choice() method instead of random.choice. Refer how to Cryptographically secure random data in python. Above all combinations are depends on String constants and random module functions. There are also other ways available to generate a random string in Python let see those now. Python 3.6 introduced a new module called Secrets Module to secure random generator. We can use the following two approaches to generate a random string using a secrets module. Let see both the approaches using the following examples. """Generate a secure random string of letters, digits and special characters """
The random string generated using a UUID module is suitable for the Cryptographically secure application. the UUID module has various function to do this. Here in this example, we are using a uuid4() function to generate a random string. Let see the example now. randomString  = randomString.upper()[0:stringLength] # convert it in a uppercase letter and trim to your size. The StringGenerator module is not a part of a standard library. However, if you want you can install it using a pip and start using it. Use render() method of StringGenerator.